My Bargain Basket: Living Organized: Proven Steps for a Clutter-FREE and Beautiful Home (FREE ebook)! Living Organized: Proven Steps for a Clutter-FREE and Beautiful Home (FREE ebook)! 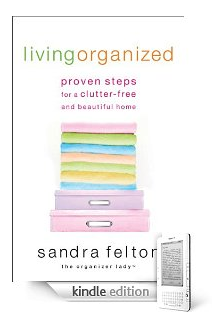 Download a free copy of Living Organized: Proven Steps for a Clutter-Free and Beautiful Home by Sandra Felton. This ebook is specifically for Kindles, but you can go here to download a free application which enables you to read Kindle ebooks on your PC, Blackberry, Mac, or iPhone.